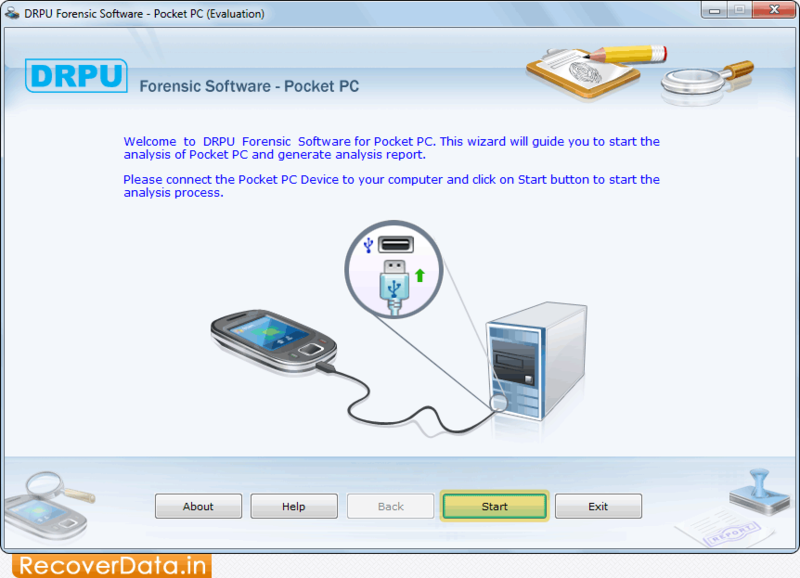 Pocket PC Forensic Utility extracts and provides detailed information of any Pocket PC and other Windows based multimedia mobile phones. Forensic evidence collection is a useful utility for investigation agencies to acquire detailed evidence report. Software displays all files, folders, database records, Windows OS registry files and all phone book general information about your Windows OS based Pocket PC device. Smart Phone Forensics software shows general information about your multimedia Windows based Pocket PC such as mobile Manufacturer name, Model number, IMSI number, IMEI number, Phone Book number etc. Pocket PC Forensic program generates acquired Phone information analysis report for detailed information about each file saved on your Pocket PC device. Investigation tool supports all major brands of Windows OS based Pocket PC phones such as AT&T Tilt, Anextek SP230, Asus P525, Asus P05, Audiovox, E-ten M500, HP iPAQ, Hitachi, i-mate, Mitac Mio, Motorola i930, Motorola Q, Motorola MPx, Gigabyte gsmart i120, BenQ, Orange SPV E200, O2 Xphone, Palm Treo 700w, Pantech smart phone, QTEK 8500, Siemens SX66, Samsung blackjack, Samsung i320, Sprint Touch by HTC, Sony Ericsson PDA Device etc. Software allows user to extracts and analyze detailed information about your Windows OS based Pocket PC, PDA, Smart phone, Portable Media Center devices etc. Pocket PC Investigation Utility generates report of analyzed and extracted information in different formats and saves at user specified location. Extract complete information about software and hardware architecture of your Windows OS based Pocket PC. Software saves the recorded and investigated information in the text format for future usage on your PC. Important note: Synchronizing your mobile device with your PC is a faster, easier way to connect your desktop or tablet PC and your Windows Mobile powered device to transfer information, settings and files. Synchronization is handled with different applications for Windows Vista and Windows XP or earlier, so check which operating system your PC is running on. If Your Laptop or PC is running on Windows Vista, your synchronization settings will be managed through the Windows Mobile Device Center. If Your Personnel computer is running on Windows XP, or earlier versions of Windows operating system, your synchronization settings will be managed through Microsoft ActiveSync.